Senator Bernie Sanders (I-VT) and Congressman Mark Pocan (D-WI) have introduced the Workplace Democracy Act, a bill that will repair our badly broken labor laws by restoring to working people the right to join a union and negotiate a first union contract. Tell your Senators and Representative to support this important pro-worker legislation! 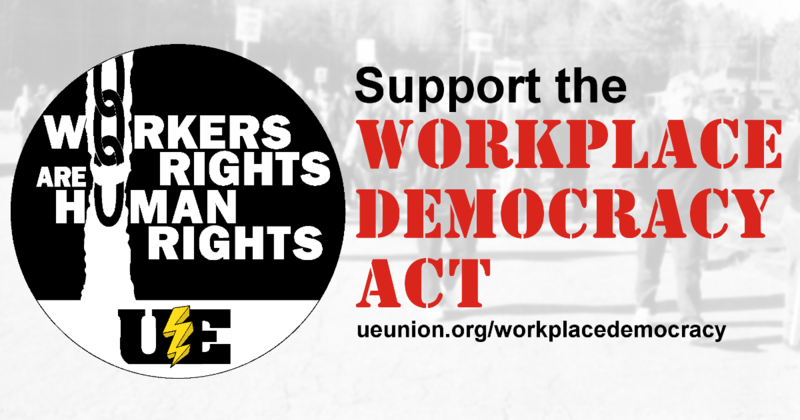 Call (202) 224-3121 and ask your Senators and Representative to co-sponsor the Workplace Democracy Act (S 2810 in the senate, HR 5728 in the House). Download, print and distribute this leaflet — or share the online leaflet. Share this meme on social media (click here to share on Facebook and click here to share on Twitter). Workers' rights are core values of any democracy. Providing strong, uncompromising freedom and legal protection for workers to organize, gain a collective bargaining agreement, and resolve conflicts with their employer are fundamental to a fair society. This legislation mandates stronger legal protections for workers to exercise their basic first amendment rights: to speak, assemble, and to organize. Thousands of workers are harassed, bullied, and fired each year while trying to organize a union, and corporations willfully violate labor laws without fear of prosecution or penalty. We are working and living in a labor rights emergency. This undermines the rights of workers to join together and bargain for better wages, benefits and working conditions, and fuels rising inequality. Today, corporate profits are at an all-time high, while wages remain stagnant and benefits and working conditions continue to be slashed. Although the Workplace Democracy Act is unlikely to come to the floor of the current anti-worker Congress, it is still important that we work to build support for this legislation. Our future as a union, and as a labor movement, depends on our ability to secure the kind of real labor law reform that this bill contains. We must educate ourselves, our members, Congress, and others in the labor movement about the contents of this bill, and why it is so important for them to help publicize and support it. Any member of Congress who expects working people to support them should co-sponsor and support this bill instantly. A refusal to do so will speak for itself.